This chicken was so, so good! 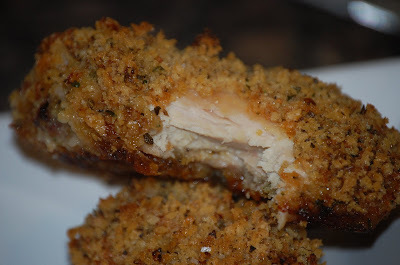 Unlike other Oven "fried" chicken recipes that tend to have mushy breading, this kept it's crunch and was just plain delicious. I got the recipe from FN's "Ask Aida". I am not a fan of the show, but since my tv seems to be on that channel often, it was on and I watched the episode. It looked good, but even better, EASY. I'm all about easy these days. I deviated from the original recipe a smidge, (noted in red) but it is a great and simple recipe. Marinate chicken at least 5 hours or overnight in buttermilk. Heat the oven to 425F and arrange rack in the upper third. Set a rack on a foil lined baking sheet; set aside. Combine flour, 1 teaspoon of the salt, and 3/4 teaspoon of the pepper in a shallow bowl, mix until well combined; set aside. Combine Panko, 1/3 cup of the parsley, 3 tablespoons of the olive oil, 1 1/2 teaspoons of the salt, and all the lemon zest in a separate shallow bowl, and toss until evenly combined; and set aside. Whisk together eggs and cheese in a shallow bowl until evenly combined; set aside. To coat chicken, dredge a piece in the flour mixture and shake off excess. Then dip into egg mixture, let excess drip off, and finally roll in the breadcrumbs, pressing to adhere as necessary. Place chicken piece on baking sheet and repeat with remaining chicken. Bake until coating is golden and crispy, juices of chicken run clear when poked, and internal temperature is 160degreesF, about 40 to 45 minutes. *If you can't find skinless, bone-in chicken, by it with skin on and pull it off ( I recommend this, the skinless is much more expensive!). To get a better grip, grasp skin with a paper towel and pull! In the ingredient list you have 2Tbs.cup of parsley, but in the instructions you say combine 1/3 cup of parsley with the panko crumbs, which one is it. Also why did you omit the lemon zest. 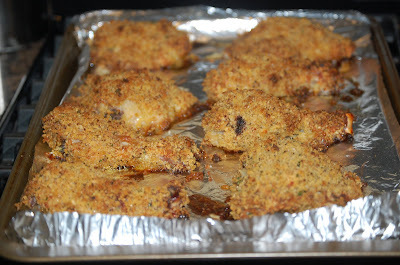 Great weeknight chicken recipe! Thanks for sharing. Great recipe! 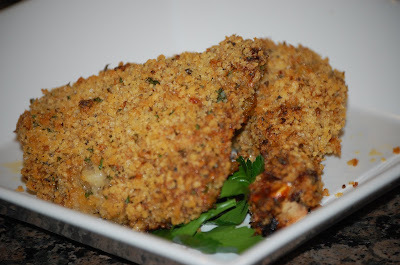 I think it is the panko that makes it so crispy! Your chicken looks awesome, I know what I am trying this weekend, thanks so much for the idea.